TRIPOLI, Libya — The NATO bombardment of Tripoli has forced Moammar Gaddafi into hiding, a spokesman for the bloc said Friday, as Western officials kept up efforts to undermine support for the Libyan leader. Libyan navy and coast guard vessels along the coast were hit by NATO late Thursday, including several in the port of Tripoli, according to Libyan and NATO officials. The strikes will effectively shut down the port, the country’s largest, Libyan officials said, because commercial ships will no longer want to dock there. Western military officials concerned about a stalemate have escalated pressure in recent days to try to get Gaddafi to relinquish his 41-year grip on power. 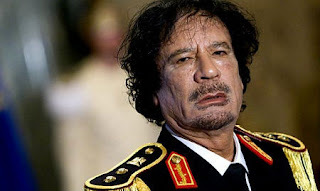 Western officials appear to be trying to isolate Gaddafi in the hopes that support for him will eventually melt away at the highest levels of his government. One top official, Shokri Ghanem, head of the National Oil Co., fled the country this week, and the Libyan government says it has been in only intermittent contact with him since. Secretary of State Hillary Rodham Clinton also said in an interview with CBS News late Thursday that Gaddafi’s wife and daughter had fled across the border to Tunisia, an assertion denied by both the Tunisian and Libyan governments. NATO has been dropping leaflets and broadcasting radio messages aimed at government troops, telling them to abandon the fight, Bracken said. He said that the alliance had struck eight ships — in Tripoli, in Khoms, 78 miles east of the capital, and in Sirte, 200 miles east of Khoms. The ships in Khoms were “directly linked” in recent days to an assault on Misurata, a besieged rebel-controlled city in western Libya where NATO has said government forces have laid mines in the port. The head of Libya’s coast guard, Commodore Omran el-Forgani, told reporters Friday that nine ships had been hit. The discrepancy was not immediately explained. Reporters who inspected some of the coast guard ships that had been hit in Tripoli saw small gunboats that Forgani said were used to patrol waters to curb illegal immigration to Europe. Although the patrol boats appeared to have missile launchers, he said those were a remnant from their prior use as navy ships and were not equipped with missiles. Forgani said that the NATO airstrikes had also hit a larger frigate-class navy ship, but reporters were not allowed to examine it. The port’s general manager, Mohammed Rashid, told reporters that just seven or eight ships had docked in Tripoli in the two months since NATO operations began. Before that, the port took in two to five ships a day, he said. Also Friday, the family of South African journalist Anton Hammerl, who had been missing in Libya since early April, announced that they believed he had died when under assault by Libyan government forces as three other journalists were taken into custody. Those journalists were among four released Wednesday, and they contacted Hammerl’s family once they were out of Libya. The Libyan government had given conflicting reports about whether it had Hammerl in custody. At least 14 journalists are still believed missing or in government custody in Libya, according to the Committee to Protect Journalists.